It’s a very short and very quick blog post for today as I have to crack on with my essay before I submit it tonight! I really wanted to have something up, and I’ve wanted to talk about these little treats ever since they arrived in my mail last week. You’re probably all sick and tired of me talking about my dry skin issue now, and how being on Accutane makes it worse. But the reason I’m mentioning it yet again is because these little tubes of Dr Paw Paw Multipurpose Soothing Balms* are mini miracle workers for dry, chapped skin. I’ve been using them non stop, and so I thought it would be best to write up a quick post and share the discovery. These balms come in 25ml tubes, and a little goes a long way. 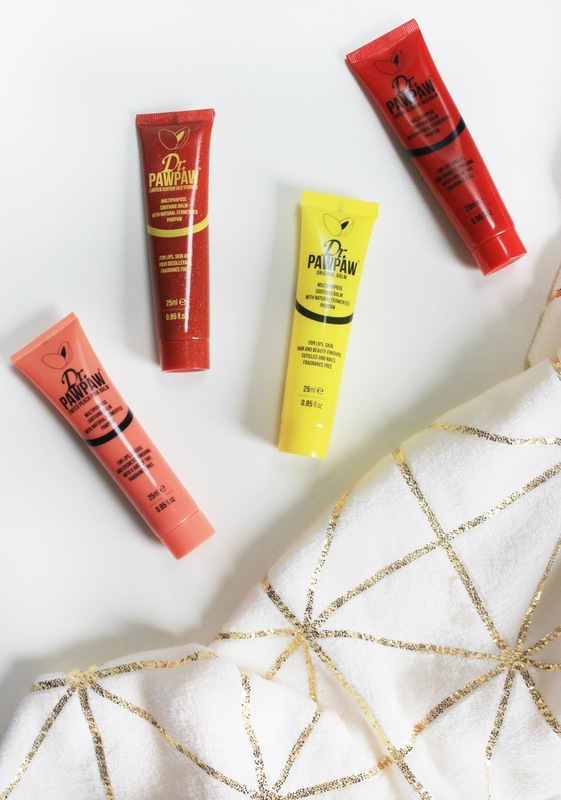 There are four different varieties, so which balm you go for depends on what you’d like to use it for. I use the original balm the most – it’s perfect for dry hands and cuticles, as well as dry elbows and knees. However, there are three tinted varieties which are also available: Peach Pink, Ultimate Red and Red Sparkle (LE). These are some more fun options which you can use as tinted blushers or lip balms. I’ve been loving the peach pink shade – it fits right into the spring trends going on right now, whilst also being incredibly hydrating for a pop of colour on a really light makeup day. I haven’t used the red shade yet but I can’t wait to give that a whirl once the summertime rolls around. They aren’t the most long wearing products as blushers, but they’re certainly lovely for quick makeup when running errands or going about your day at home. These balms have also recently been awarded the PETA badge and so they are officially cruelty free and vegan! Each of these retail at £6.95 in Superdrug, but QVC are selling all four for £19.50 plus £3.95 postage. Have you tried the Dr Paw Paw Balms?